❤【Bluetooth 4.1 Transmitter + Receiver】: A single adapter with both transmitter and receiver function, multiple connection options, and aptX support offers you complete flexibility and quality when creating wireless sound and audio. ❤【OPTICAL+RCA+3.5MM】: Designed with three different connection options to meet your different demands. You get maximum flexibility with support for both Digital Optical SPDIF and 3.5mm (AUX and RCA); both input and output are supported. ❤【Instant Sound】: Enjoy a latency lower than 95% of other devices with aptX Low Latency technology; you can watch TV / Movie / Video and listen to high-clarity sound in perfect synchronization. ❤【Dual connection】: Share the fun by transmitting audio to two Bluetooth headphones or speakers simultaneously; reconnects automatically to the last two paired devices. 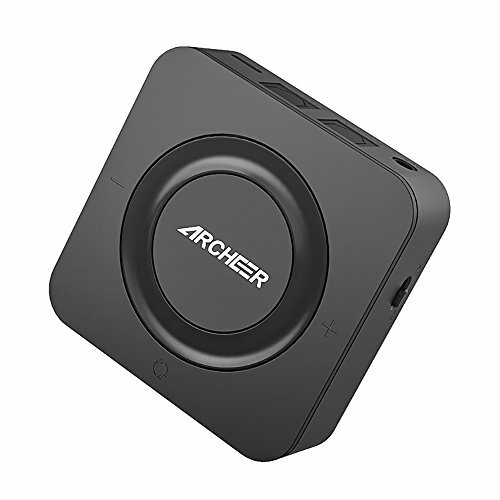 ❤【Always on】: ARCHEER Bluetooth adapter stays on and continuously streams even while charging. Built-in battery for up to 19 hours use, enjoy your favorite wireless content all the time.